I love animals ~~ that’s why I am mindful to enter to the wonderful world of pet sitting since Dec’14. I love taking care of them and showing them love! My family members include two lovely cats and Shihtzu (mixed breed). As a pet owner, I understand stress of arrangement of furkids & importance of trusting someone to take care for your “kids”. I will take care and spend time with your furkids like my own. I have experience pet care from small tiny hamster to medium large breed dog such as Golden Retriever, Labrador & Husky. Services Provided: Dog Walking, Daily Visits, Overnight Pet Sitting, Home Boarding. Location: Bangsar, Batu Caves, Selayang, Sentul, Kepong, Desa Park City, Wangsa Maju, Damansara Height, Mid Valley etc. I am a vet nurse that have been working in the zoo almost 4 years, and mostly i can handle with any kind of animals quite well. I started the pet sitting service as a part time job since last year in 2015 as my friend suggested to me this service. I realize that this is very convenient for me and for the owners as i no need to bring back the animals home for me to look after. One of the main reason that make me more interested in this pet sitting service is because for me it is very important for the animals to feel comfortable and safe in their own environment compared to boarding. My name is Intan. When I was young, I always surrounded by animals starts with a cat and rabbits and since then they are my soft spots until today which I own 16 cats and the oldest age 8 years old. I can pet sit all the animals like cats, dogs, hamster, rabbits etc but not cold blooded animals because I don’t have any experiences with them. Basically, the service I can provide is daily pet sitting, dog walking and pet taxi. I am available from Mon – Sun (from 10 am onwards) and location will be Petaling Jaya, Kelana Jaya, Damansara & Bangsar. Since I was a child, I have had some special connections with animals. I have experiences in taking care of pets since I was 14. Today, I am a proud owner of 2 dogs, 2 cats & 1 rescued senior dog. My love for animals is limitless - hence I have joined this petsitting community to share my love to all sorts of animals out there (yours could be it!). With assurance that I will care for your pets as much as I care for mine, you will no longer need to worry of the wellbeing of your pets while you are away! Love has always been a natural connection between myself and wildlife. Ever since before I could speak, I have loved animals. I have had many pets, however; I am currently unable to keep animals with fur as my mother is severely allergic. So, when I found out that being a nanny to others' pets is a job, I felt as though my dreams have come through. Given the opportunity to look after your pets, I will love & care for them as though they are my own. My passion is always on animals. I adopted 17 cats, and counting. 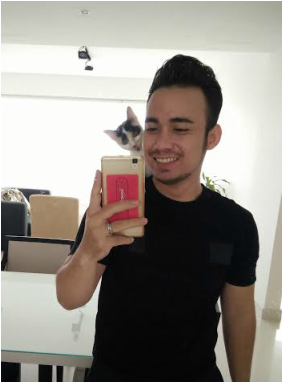 Joining Pet Nanny Malaysia is a dream come true for me, because I can meet, get to know and take care of other animals. 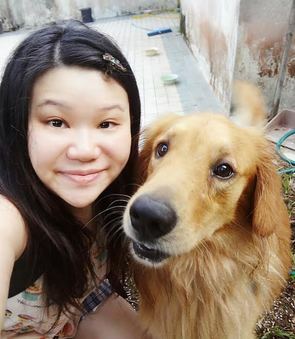 As a part time pet sitter which has been 3 years now, I can manage my time to meet customers' need on taking care of their precious pets whether overnight or daily visit. Making sure customers' pets are at their best comfort environment, which is their own home, is my number one priority in doing pet sitting job. I am available on weekdays after 5.30pm and whole day on weekends. Do contact me if you are in need of a nanny for your pets. I love making new pet buddies, and want to ensure they are as happy as can be. Prior training classes at Pet Nanny Malaysia have taught me how to interact with pets (especially dogs) that may be a bit timid, or shy with new individuals. Pets are great companions and look forward to meeting many new buddies! Types of service : Petsitting , Overnight/house sit, dog walking. My name is Yun Hui. I have always had pets such as dogs, cats, hamster and fishes as part of my family. Currently, I kept 2 dogs as my companion in my house which are a Pomeranian and a Husky. I and my sister are dedicated to the large breed dog especially Husky and Alaska Malamute. For the past few years, We have participated in many MKA dog competitions to compete for the Grand Champion title. Beside monetary, the main reason that inspired me to become a pet sitter is I am able to met all kind of pets especially dogs and spent some quality time with them without have to pre-own them. Beside this, as a pet parent, I understand that it is difficult for pet parents to find a pet sitter , whom they can trust that the pet sitter will care for their pets as lovingly as they do. 3. Pet Taxi – Pick up and send the pets to the appoint destination. ​Location that I can handle: Rawang, Selayang and Kepong. I have always loved animals from as young as I can remember. From as early as eight years old, I started pestering my parents for a pet to care for. Until today, I still have my pet dog with me. He is 14 years old this year. Everywhere I go, I connect more easily with animals than humans. I am quiet and shy by nature but if a person happens to have a pet with them, I suddenly have the courage to chat up with them.Simply being able to connect with an animal brings me immense joy and happiness. As a pet nanny, I am willing to care for your pet(s), take them for walks, feed them, and play with them while you are away. As a pet owner myself, I know how it feels like to part with your pet for extended periods of time and I am more than glad to relieve you from that feeling while you are away. Hello there..my name is Caroline and I am an animal rescuer, fosterer and owner. I have pets my entire life ranging from dogs, cats, snakes, fish, rabbits, birds, civet cats etc.. I adore animals and firmly believe that it is our responsibility to care for them. Also I do believe animals teaches us how to love. In any case, life is always so much better when there is a litter fury creature waiting for you to come home. Ever since I was little, I have been around and loved animals. My parents were very influential in teaching me to love and care for them. I started pet sitting when I was 18. I have experience pet sitting for neighbour’s and friends’ pets when they were away from home. Service provided: Private Boarding( Dogs, Cats, Rabbits), Private Dog Walks, Daily Pet Visits, Pet Taxi. Area served: Johor Bahru,Taman Johor , Bukit Indah, Skudai, Taman University, Taman Mount Austin, Taman Molek. 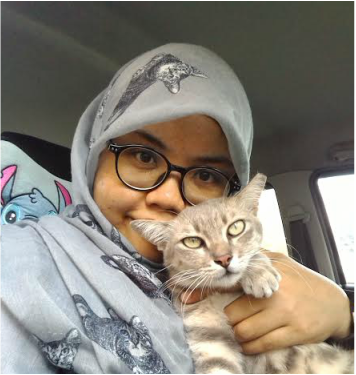 Joining Pet Nanny Malaysia has been really helpful as I can make friends with people of the same compassion for animals. I am looking forward to get to know assorted animal behaviour as I want to open a public animal shelter in the future. Currently taking care of own cats, 12 of them and giving shelter to 10 stray and feral cats. Previously I had hamsters and birds as pets too. I am available for full time pet sitting. Hi, I am kritika, I am fosterer and petsitter. My passion is always animals. Since childhood, I had a special connection with animals, I believe that animals also have feelings, love them and they will love you back. As a pet owner of (two huskies, iguana, sugar gliders, gecko, turtle) I understand the stress of arrangement and trusting someone else to take care of your fur-kids while you are away. We can handle any kinds of small, exotic and big animals as we have experienced with any kind of pets. My husband worked in zoo as a volunteer as well. My place is clean, safe, comfortable, no caging, air-conditioning, gated with a big garden. I am available on every weekdays and weekends as I am full time pet sitter. Services provided - private boarding, dog walking,daycare, bathing, home visits depends on availability, pet taxi for small animals. Types of pets-dogs, cats, rabbits, any exotic and small and big animal. I have grown up always loving animals. I did not receive my first cat until I was twelve and my life has been changed ever since. The amount of comfort pets can provide to me and my family member knows no bounds. I love it because of their innate ability to sense how i feel and what needs to be done in order for me to be cheered up. Our pets show us love that is so unconditional and pure, we are their whole world. The love and care I have for these animals is something I know will be consistent throughout my life. I will start my service at 7am-8am and 8pm-10pm weekday and anytime for weekend. My services only at your place. Location : Bangsar South, Kerinchi, Sungai Besi, Klang Lama, Kuchai Lama, Bukit Jalil, Sri Petaling and etc. I got 2 adorable dogs at hometown and 1 cute cat in my current place. I'm a working adult, available petsitting time : 7pm onwards Monday to Thursday and most public holidays. Service area : Kl area: Kl Sentral , bangsar ,midvalley, happy garden, taman OUG, pandan cahaya, pandan indah, kuchai lama, taman danau desa,bukit jalil,sri petaling. and give you peace of mind with regard to the wellbeing of your pets during your absence. Service : Petsitting dogs, cats, hamsters, guinea pigs and other small animals. ​My name is Abbie. I always have the liking towards animals. Since young, I grew up with animals around me. From small pets such as hamsters, guinea pigs, chicks, dogs, cats, fishes,reptiles and many more others throughout my childhood.I always have a soft spots for animals. At the moment, I have 4 dogs, 4 parrots, 1 rabbit at home. Pets are not animal, they are families. I can pet sit pretty much most warm blooded animals, i.e : dogs, cats and small animals (rabbits, hamsters etc) but not reptiles as I still have very limited experience with them.